Based on our Inlaw Design we can fulfill all your sound- and design requirements! Four or five or more strings, 21 or 24 frets? Bolt-on or neck-thru? One-piece neck or laminated? Rosewood-, maple-, pau ferro- or ebony fingerboard? 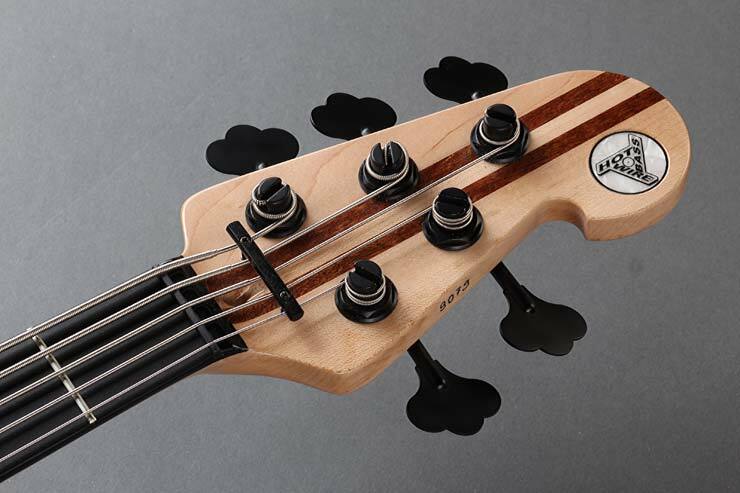 Headless or fretless? Big or small frets? Which pickup combination? Electronics: Passive or active, and number of controls? Body wood? Figured top? Matte finish or higloss? LEDs in the neck? Hardware: chrome, black or gold, and of which type? 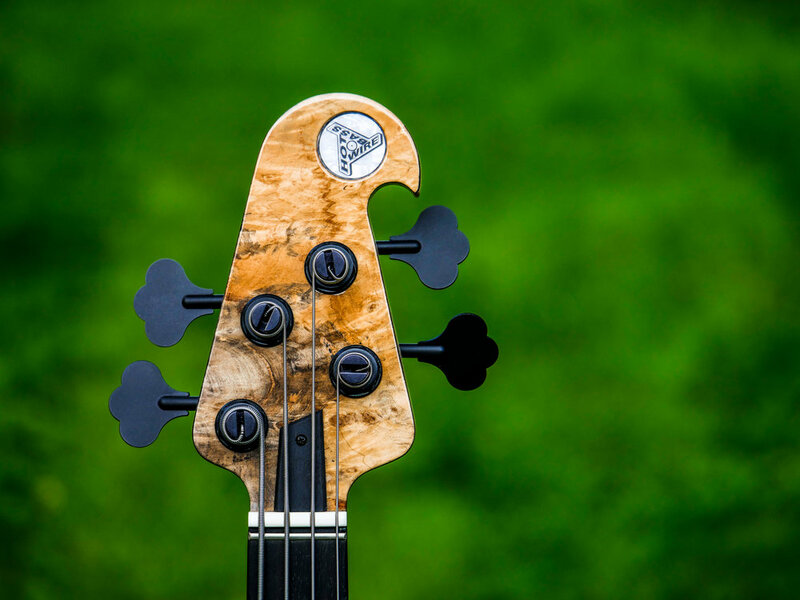 We offer qualified advice, and we can turn your ideas into a great instrument! Upon your request for a quotation, we will get back to you with a detailed offer. 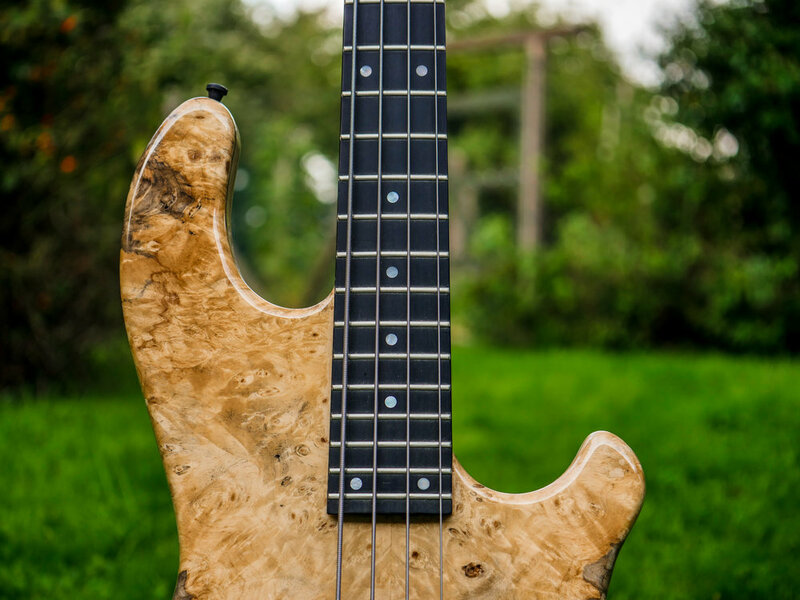 This one has a beautiful Buckeye Burl top. In general, we have saved nothing on this model. The full-length neck consists of three strips of maple and two strips of sapeli mahogany. The fingerboard is made of ebony. The attached body wings are made of swamp ash. Two Hotwire dual-coil W-buckers (the coils are switchable: serial - single coil - parallel) deviier the sound. The East Uni-Pre offers bass, treble and parametric midrange for optimal tone control - this bass can be anything from vintage old-school to reggae to modern P-funk. The thru-neck, constructed from several strips of maple and sapele mahogany, provides a balanced tone and a very special feel. The XXL scale with a sounding string length of 900 mm guarantees a ultra-deep sound on the thick strings. 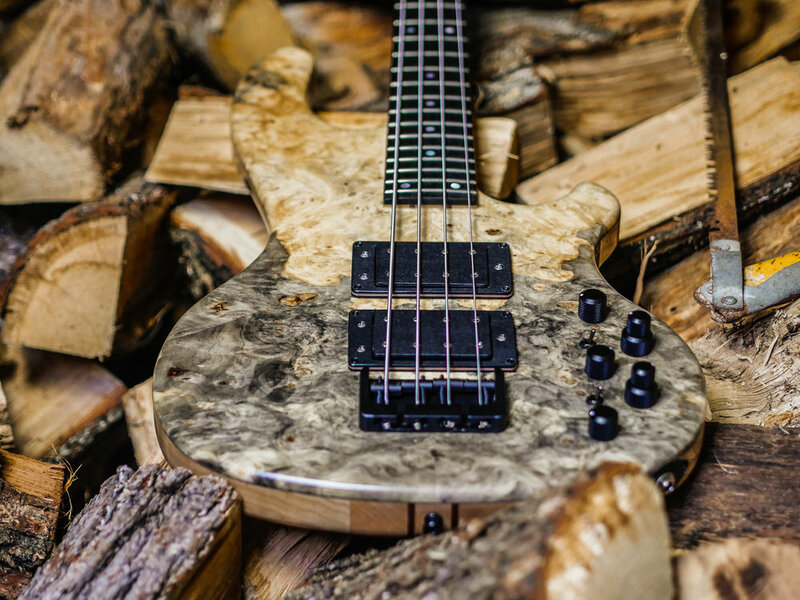 The body consists of two parts of swamp ash. 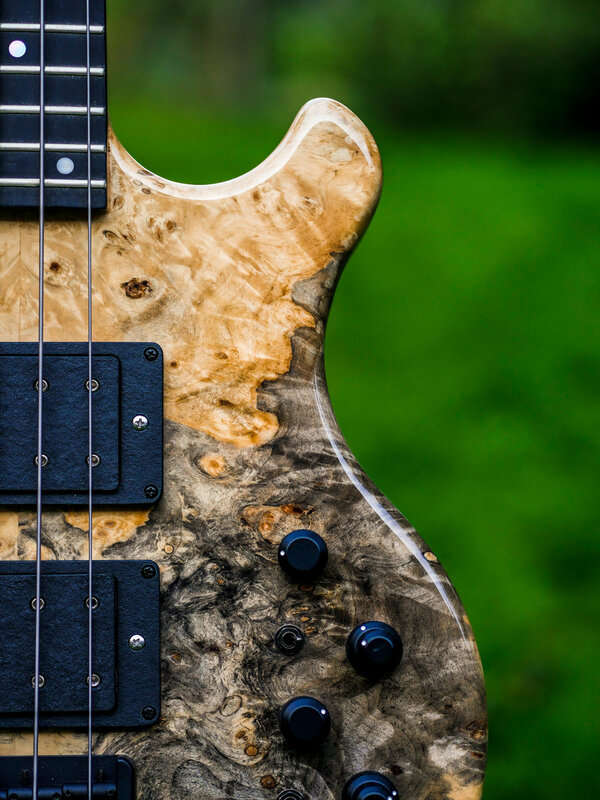 The high-gloss finish brings out the finer points of the noble Buckeye Burl top particularly well. Our W-Bucker thumps out a huge sound already in passive mode. These power pickups are combined here with a Noll three-band tone control with active bass, treble and center controls. 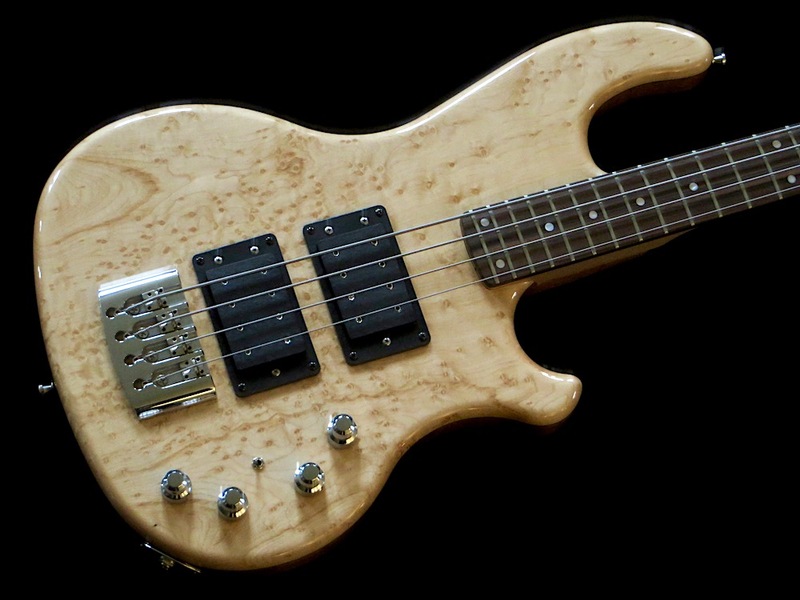 In addition, the pickups can be switched serially, in parallel and as a single coil, so a very authentic J-bass tone is possible, or a P-bass sound, a very fat or a slim sound. Here we see the five-strip glued neck of two broad strips of maple, two narrow strips of sapele mahogany and a narrow maple stripe in the middle. 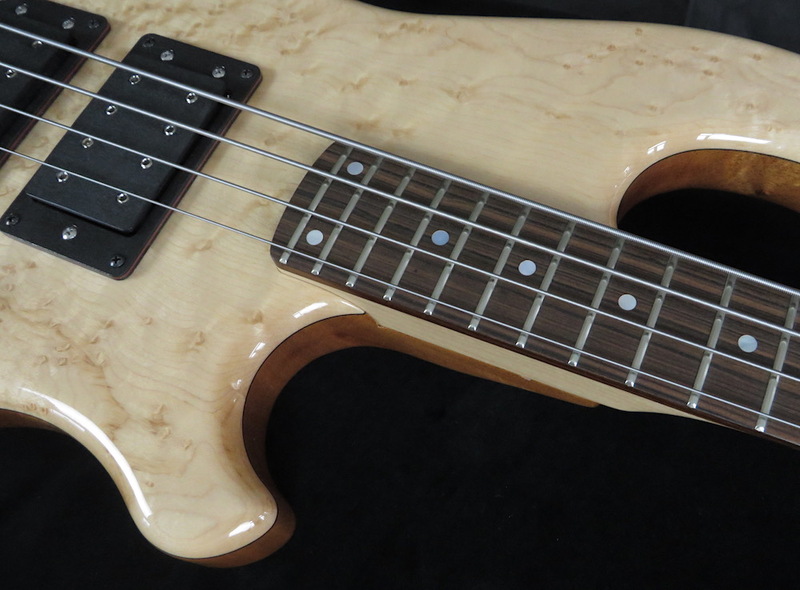 The body side parts consist of swamp ash. Each of the "Motherbucker" pickups has two stacked humbuckers in J-Bass format in each cover. Actually you have four stacked humbuckers hehre! Using mini three-way switches, these can be operated in series, in parallel or as a single coil. Whereby the single coil function is also humbucking thanks to stack construction. 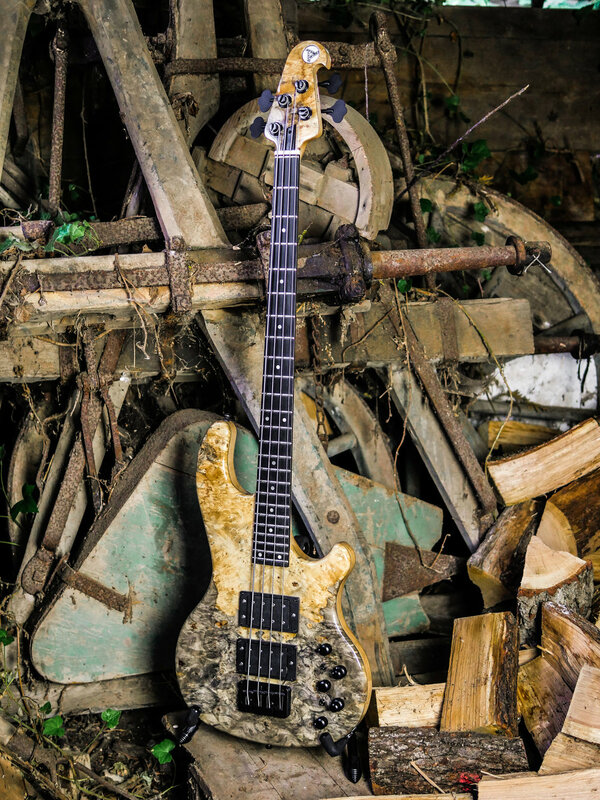 This bass can do anything but hum. These features alone provide a great variety of sounds on the passive level. The built-in East UNI-PRE 5K sound control provides even more sounds. Bass, treble and parametric mids are available, volume and pan, plus a passive tone control, which also acts as an active / passive switch. The treble control also provides a bright function when you pull the knob. In the electronics compartment you can tune the bass sound with trimpots individually to your needs. The parametric mid control has a cut / boost of 14 dB with a frequency response of 100 Hz to 2.5 kHz. Watch out, here comes the Hot Wire Inlaw 424 (i.e., 4 string 24 frets) Ferrari with high gloss finish, bird's eye maple top and multi-strip neck. The body is made of khaya mahogany. The high-gloss finish brings out the subtleties of the noble top particularly well. 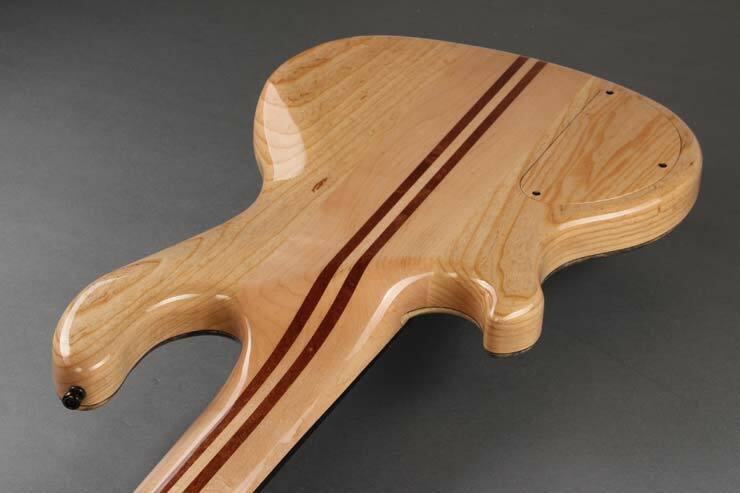 The bolt-neck is made of several stripes: hornbeam in the middle, bordered by sapele and maple stripes. The Pau Ferro fretboard looks good, sounds good, does not fall under the CITES regulation and thus allows stress-free border crossings, no papierwork involved. Two W-buckers already generate a huge sound in passive mode. The East Uni-Pre 4K provides active highs, basses, parametric mids and guarantees best sound management. From "modern" to "old school", from Jaco to Marcus and beyond, we put everything into the Inlaw - just waiting for you to pull it out.